RVnGO is America's best marketplace to find RVs to rent in New Jersey. Find your RVnGO! The busiest bridge in the world connects Fort Lee, NJ to Manhattan, NY and crosses the Hudson River with an extraordinary 3,500-foot center span suspended between two 570-foot steel towers, it has the strength to carry two levels of roadway or rail. George Washington Bridge began construction in 1927, solving challenge engineers and planners had faced for 100 years and was marvel of engineering for the time being twice as long as any previous suspension bridges. Shady Pines Carefree RV Resort The southern farmlands of New Jersey is home to Mullica Hill an entire town that is on the National Register of Historic Places. Settled in the late 17th century it has over three dozen antique shops, making it a collectorâ€™s dream destination. Make sure to visit the Amish Farmers Market and set aside time to stroll the quaint township to sample wines, browse boutiques, galleries, and cafes. It is an extraordinary place to journey around in your campervan rental in New Jersey. Situated around 20 minutes outside Atlantic City, the Shady Pines Carefree RV Resort is ideal for a Class A RV rental in New Jersey. It has every one of the amenities you want in a RV Park. It has 60 accessible full hookup destinations with tables, fire rings, and space for slideouts. Make the most of its services including a swimming pool, recreational hall, horseshoes, game room, exercise classes, a 3,000 square-foot puppy run, shuffleboard, restrooms and showers, laundry, and an on-location store for your camper rental New Jersey. The Shady Pines Carefree RV Resort is open all year long. Situated in the town of Jackson, the Tip Tam Camping Resort is the spot to dock if you want to get a charge out of Six Flags Great Adventure, Six Flags Hurricane Harbor and Six Flags Wild Safari. It has 100 accessible spaces, 60 of which are full hookup destinations with tables, fire rings, and space for slideouts. Services include wi-fi, play area, amusement room, recreational hall, miniature golf, horseshoes, exercise classes, digital TV, perishables, on location RV benefit, RV stockpiling and supplies, laundry area, restrooms and showers, and controlled entryway for your travel trailer rental New Jersey. Appreciate being minutes from sea shorelines at Cape May KOA. Found right in the heart of the Jersey cape, this family-arranged RV Park provides a lovely outdoors experience for everyone. It has 350 accessible spaces, 30 of which are full hookup destinations with tables, fire rings, and space for slideouts for your campervan rental in New Jersey. Services and comforts include water activities at Lake Laurie, swimming and swimming pool, amusement room, open-air games, horseshoes, play area, recreational corridor, tennis court, pickle ball, exercise classes, lunchroom, basic needs, angling supplies, wi-fi, digital TV, golf carts, RV stockpiling and supplies, restrooms and showers, laundry facilities, and more for your RV rental. It is a prime spot for a travel trailer rental in New Jersey. Stop season is from April 1 to October 31. The premier culinary celebration in New Jersey, the Riverfest Food and Music Festival happens each June in Red Bank. It is a three-day family-friendly event that features riverboat travels, a children zone with rides, art, and wares in the craftsman back street, live musical performances, delicious eats with brewmaster seminars, and a wide range of other fun activities. Bring the lawn chairs and hang out for a while at the Riverfest Food and Music Festival. A celebration honoring Trenton's pivotal role in securing victory in the American revolution, Patriots Week happens at the end of December. Relive this momentous occasion through an immersive experience of battle reenactments, a colonial ball, pub crawl, lectures, walking tours and a public reading of Thomas Paine's "The Crisis" which helped to rally folks to the cause. With more than 70 fun events to choose from, you're sure to walk away with a new-found appreciation of the USA! Historic celebrations, various stimulations, and marvelous destinations make New Jersey a road trip must for the bucket list. 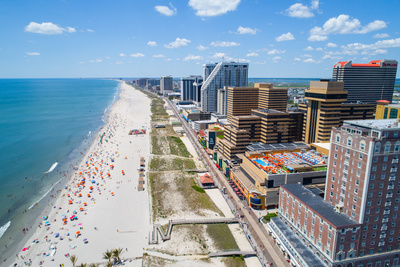 Book a RV rental to New Jersey at RVnGO and don't pass up a major opportunity to visit the shore!"